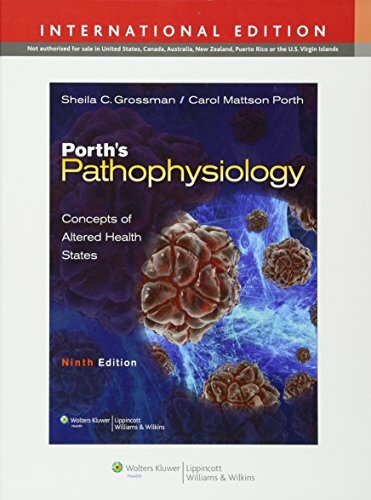 Succeed in your pathophysiology text with this 9th edition of Porth's Pathophysiology: Concepts of Altered Health States. Captivating and easy-to understand, this proven book provides comprehensive, nursing-focused coverage designed to help you grasp both the physical and psychological aspects of altered health. Master the most clinically relevant and difficult to understand disorders with advanced 3D narrated animations. Prepare for clinical practice with 14 unit-opening case studies that put a real face on pathophysiology and help you relate the clinical presentation to the underlying pathophysiology. Master the information you need for success in your career with the unparalleled coverage of disease processes that make this text the most comprehensive pathophysiology text available. Increase your understanding of key concepts with the full-color art program that illustrates the clinical manifestations of diseases and disease processes. Find the information you need fast with the book's consistent presentation of each disease, with detailed coverage of pathophysiology, clinical manifestations, and evaluation and treatment. Reinforce your understanding of key content with chapter-ending review exercises. Develop a strong understanding of pathophysiology concepts with the easy-to-follow narrative that builds concepts on one another, defines words as content is presented, and reviews concepts from physiology, biochemistry, physics, and other sciences along the way. Deepen your understanding by pausing and reviewing salient points using the easily-identified section-opening Objectives and section-ending Summaries. Retain and apply text information using Key Concepts Boxes help you incorporate key information into a larger conceptual unit, rather than memorizing a string of related and unrelated facts. Easily access useful references including lists of common suffixes and prefixes, normal laboratory values in both conventional and SI units, and a comprehensive glossary. Take your understanding beyond the book with anytime, anywhere access to the fully searchable eBook online.